Feel free to contact us if you would like to meet at Flame (olly.spinks@timera-energy.com). Economic transition: Shift from industry to less power intensive services has pulled down demand over recent years (e.g. decline in steel & automotive industries). Weather: Last 3 winters have been mild compared to history. Outliers or new normal? Efficiency: Despite government ambitions, not much evidence of structural efficiency gains to date – and a lack of clear policy incentivisation going forward. EVs: Electric vehicles likely to materially increase demand from mid next decade. Next 5 years: Limited industry left to transition, lack of efficiency traction & EV impact support demand stabilisation… caveat economic risks e.g. Brexit/recession. De-carbonisation: The focus/value of gas portfolios is evolving with the energy transition. Big gas players looking to diversify e.g. into power / CCS / alternative fuels. Power sector linkage: Growing gas & power market dependency driving gas portfolio diversification options e.g. Shell buying First Utility, Equinor expanding offshore wind. LNG market growth: Rapidly expanding LNG supply & liquidity = key source of new growth e.g. utilities (Uniper) and traders (Vitol, Trafigura) growing portfolios. Trading: Companies targeting growth in trading to increase returns & manage risks. E.g. Equinor buying Danske Commodities; Uniper global trading expansion. Refocusing: Companies are also shifting focus within the gas supply chain e.g. Engie & Centrica pivot towards energy services. Platts Analytics: Head of Modelling for European Gas & Power. Eclipse/Platts: Senior Analyst, helping build Eclipse’s European gas analytics capability. ArcelorMittal: Head of Gas Sourcing & Trading, leading the development of ArcelorMittal’s European gas trading capability. Cargolux/CRP Henri Tudor: Spatial modelling of aircraft noise and emissions for a cargo airline. EPSCI: Jessica studied fundamental and applied Physics and Chemistry at France’s top ranked engineering university. Jessica is already busy analysing merchant battery value capture for a client as well as working on expanding Timera’s gas analytics capability. Very competitive packages including direct participation in company value growth. Significantly more flexibility and autonomy than other companies, covering e.g. location, work hours & remuneration structure. An open, innovative & entrepreneurial environment with a variety of stimulating analytical challenges across the rapidly evolving energy industry. After European LNG imports hit record volumes in Mar-19, Gazprom is showing no signs of pulling back on flows. 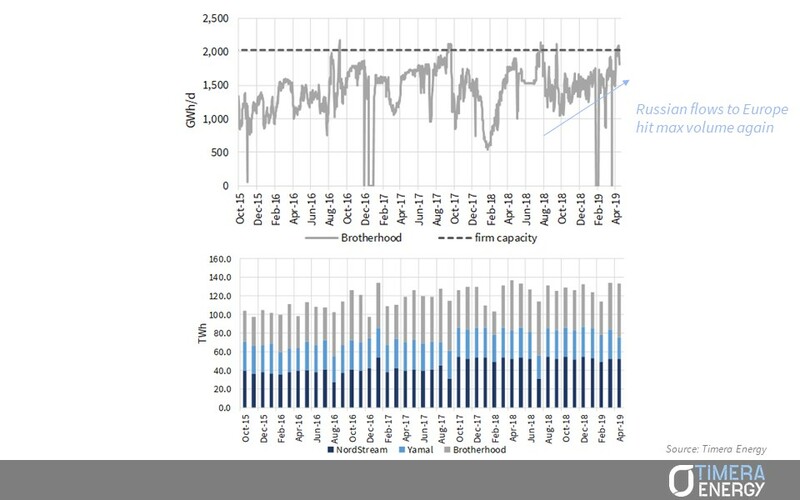 Russian flows via the Brotherhood (Ukraine/Slovakia) ‘swing’ route have hit max capacity again in Apr-19 (although this partly reflects maintenance on the Yamal route) – see top chart. Based on flow rates to mid-month, Apr-19 volumes look like they will be close to the record set in Mar-19 – see bottom chart. Strong LNG & Russian flows are holding TTF prices around 5 $/mmbtu (15 €/MWh) into summer. 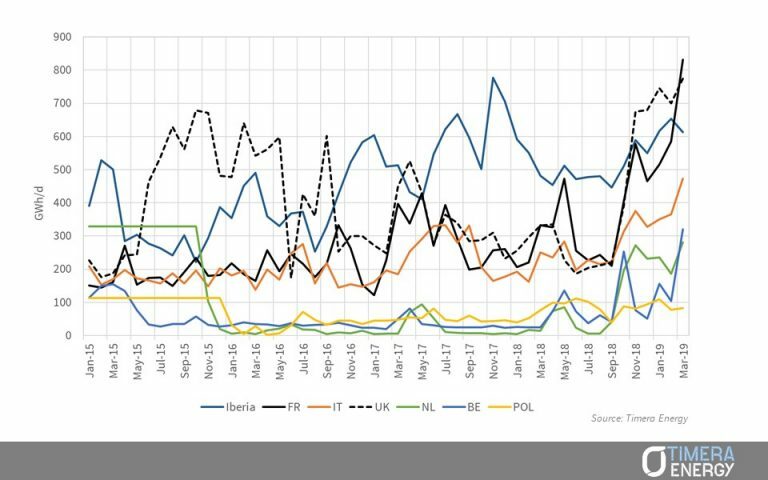 European LNG import volumes in Mar-19 broke above their previous record in 2011 (with terminal send out averaging ~3400GWh/d). The chart shows a breakdown of send out volumes across key markets. The ramp in import volumes are focused on terminals with access to liquid hubs to absorb gas. France (e.g. Dunkerque) and UK (e.g. Grain) have seen particularly high volume growth across Q1-19. Sunk cost dynamics around existing holders of long term regas capacity are also playing an important role in driving flows. 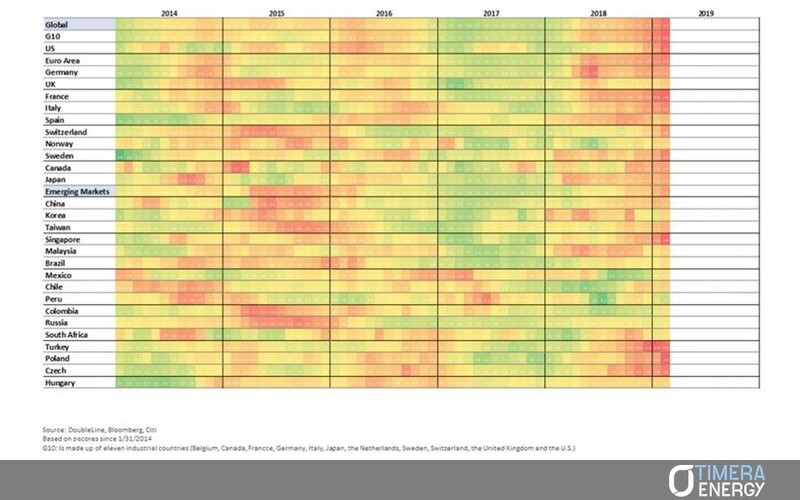 The table shows a heatmap of global economic momentum published by Doubleline Capital (leading US fund manager). Last time we looked at this heatmap at the start of 2018, global economies were flashing green (= synchronised global growth). Across the last 6 months the heatmap has switched to shades of amber & red. Industrial & manufacturing data from Europe’s key economies has been particularly weak in Q1-19, flagging recession risk. Watch out for an associated impact on European gas & power demand as 2019 progresses. The 20 year contracts that supported development of the IUK interconnector expired on 1st Oct 2018. 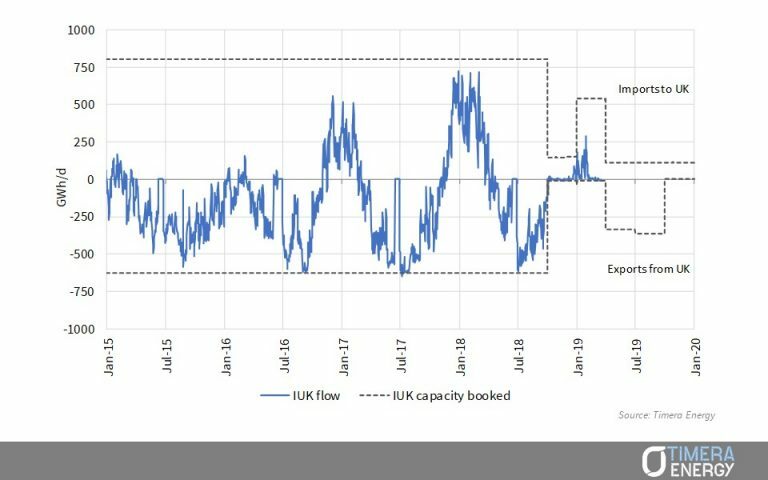 The chart shows the major impact this has had on flows & capacity bookings. Imports through IUK have fallen ~90% since last winter (20 GWh/d average so far in Win 18-19 vs 242 GWh/d Win 17-18). Export capacity bookings are currently around 50% of total capacity across the coming summer, low vs historical average flow levels. But this may in part be influenced by a heavy maintenance on the supply side schedule across the summer. This is consistent with a lower than normal summer price signal to flow gas from NBP to TTF (Q2-19 1.1 p/th NBP vs TTF discount, Q3-19 0.1 p/th premium). The BNEF annual battery cost survey provides a useful benchmark for the cell and pack cost components of battery storage projects. This typically accounts for around half of total project capex (although this varies by application). 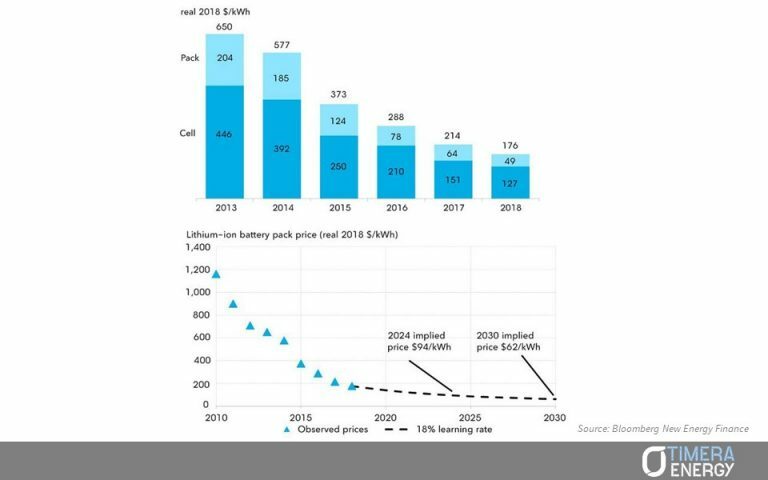 The Mar 19 survey shows 2018 short duration lithium-ion costs at 176 $/kWh, representing a ~70% cost decline over the last 5 yrs. BNEF see unit costs falling sub 100 $/kWh by 2025. Costs at that level support broad based deployment of batteries. But the key challenge investors face is the quantification of realistically achievable market revenues. A warm start to the year, high storage inventories and strong LNG imports have flattened the front of the TTF curve and driven it down. 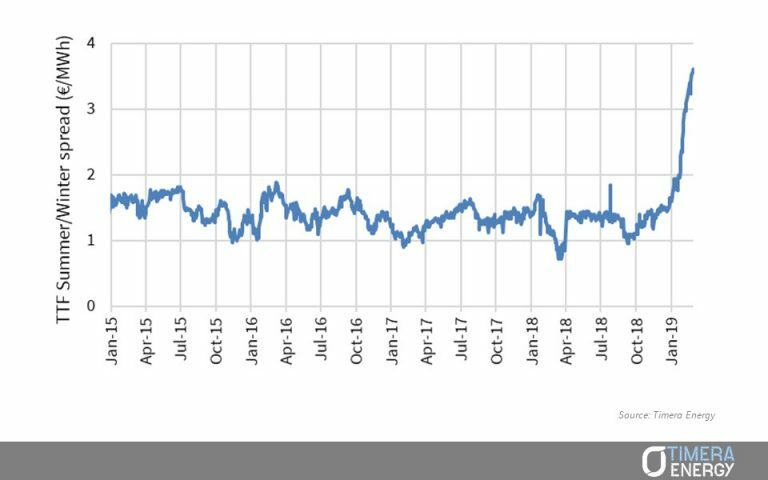 This has opened the 2019 TTF summer/winter price spread to 3.6€/MWh, the highest level since 2012. A blowout in seasonal spreads sounds like good news for storage. But higher front year spreads don’t necessarily translate into greater margins, given forward hedging of summer injection profiles. 2020 spreads have also widened but by a lesser extent, reaching 1.8€/MWh (from below 1.5).